Today I launched a portfolio website to showcase my writing and public speaking and I decided to simply call this website Javacia.com. Most people would argue that I should have called it JavaciaHarrisBowser.com, since that is my byline. 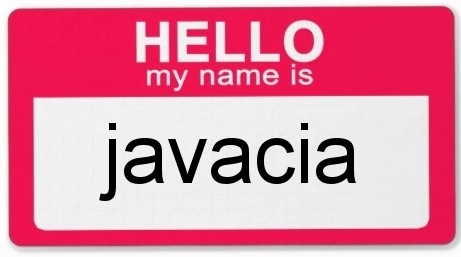 But I chose to go with Javacia.com as a tribute to my first name. My first name is the only one I can rely on. Little known fact: my name has been legally changed four times even though I’ve only been married once. Let me explain. When I was born I was named Javacia Nicole Price. Then my folks got hitched and I became Javacia Nicole Harris. But my mom lost the paper work so when I got my license I was Javacia Nicole Price again and remained that way for a year until my mom got the necessary documents to have my name changed AGAIN. Then I got married and changed my name to Javacia Nicole Bowser. Then I decided I missed my maiden name and changed my name to Javacia Harris Bowser. It's a miracle I even know my name. Despite its dependability, I haven’t always liked my first name. As a girl, while my friends were thinking of names for their future kids, I would sit in my room jotting down ideas for the pseudonym I would use when I became a published author. For years I hated my name. I was disrespectful of my name, calling it “ghetto.” When people had trouble pronouncing my name I apologized as if I and the syllables it took to address me had somehow offended them. When they looked at me as if I were a green girl from Mars and said, "Well, that's different," I felt ashamed. And when they turned to me with a furrowed brow and asked "Do you have a nickname?" I just laughed and said, "You can call me J." Then I became a journalist. And I fell in love with my byline. I became a journalist and that “ghetto” name Javacia was on the pages of The Seattle Times, The Chicago Sun, USA Today, and national magazines. Don't get me wrong. I'm in no way judging people of color who do alter their names for the sake of acceptance or a job. People do what they have to do. And I decided that what I had to do was learn to stop worrying and love my name. That same line of thinking also helped me decide to describe myself, on my new professional website, as a writer, speaker, and feminist. Yes, I used the f-word. Doing so made sense even though I recognize it was a risky move. I don’t want to do any writing or public speaking for someone who is anti-feminist. And feminism is not only a part of my work, it’s a huge part of who I am. My name is Javacia and I am a feminist. Can you handle that? Oh my gosh, I love your name! Different? Absolutely, but that's part of its charm. Ghetto? Never crossed my mind. I think it's beautiful. Thanks, Carla Jean! And thanks for reading!